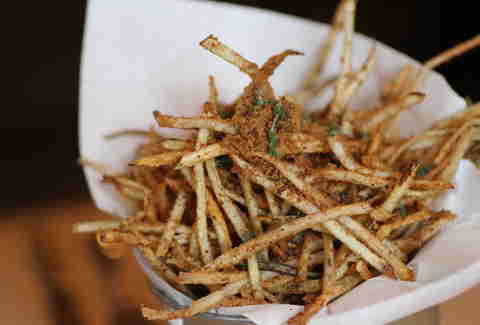 Bastille Day: It's not just an excuse to round up the six craziest French fries in America. 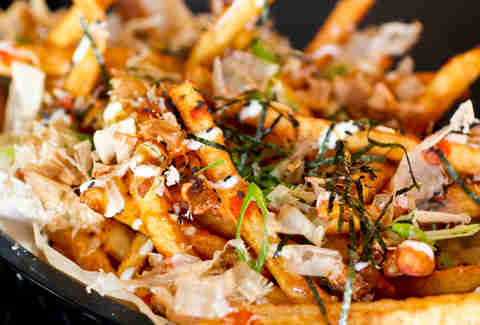 It's also an excuse to round up the seven craziest French fries in America, which's why we're doing exactly that, criss-crossing the country to put together a list that includes fries covered in everything from beef jerky dust, to crab, to... Nutella?!? Okonomiyaki is derived from the word Okonomi, which means "what you like" or "what you want" in Japanese. These hand cut, double-frieds will qualify as both, topped with homemade Japanese mayo, Sriracha, shredded nori, and bonito flakes. 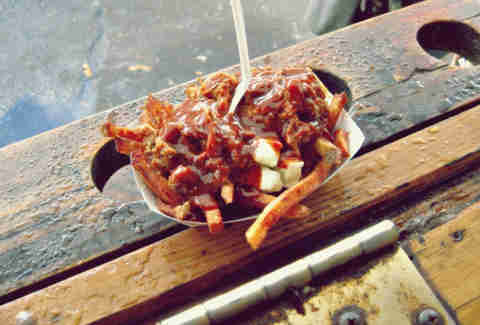 Pulled pork shoulder over fries, with cheese curds and BBQ sauce that're optional. If you're a terrorist. 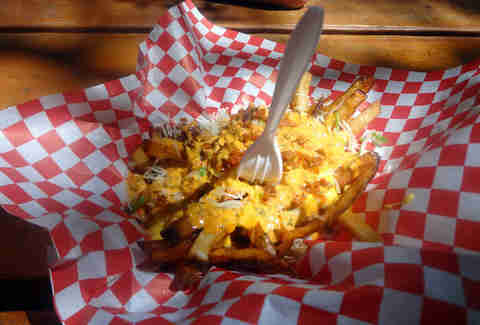 These fries have ground up beef jerky on them. 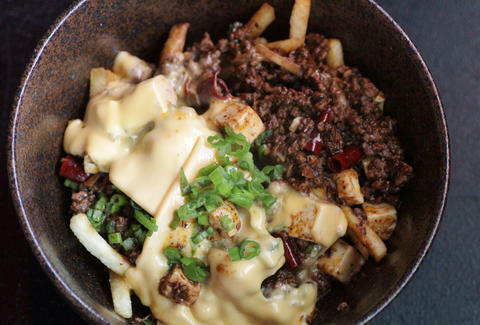 We repeat, these fries have ground up beef jerky on them. Look at these fries. LOOK AT THEM. 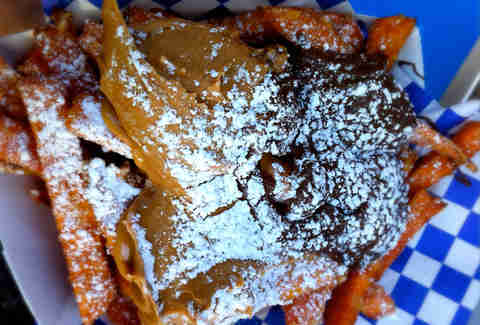 They're sweet potatoes covered in Nutella and peanut butter. Nutella. And peanut butter. 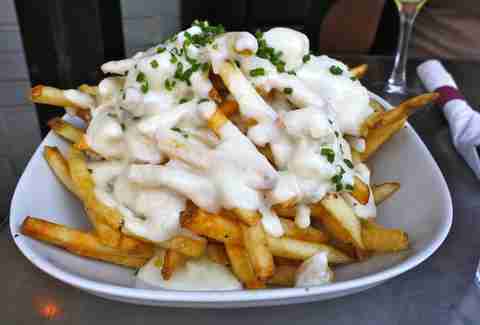 These would be exactly what they sound like if they were more specifically called Lump Crab Fries With Melted White Cheddar And Truffle Oil And Parmesan Dust. These guys'll stick a fork in you with a mound of potato sticks covered in nacho cheese, shredded Monterey Jack, marinated spicy pork, cilantro, onion, caramelized kimchi, and what Brandon Jennings said when his new teammate got to Milwaukee and was all "How do you like your wings, bro?" (spicy mayo). These're sorta like the Asian equivalent of cheese fries, in that they have fries... and also cheese!